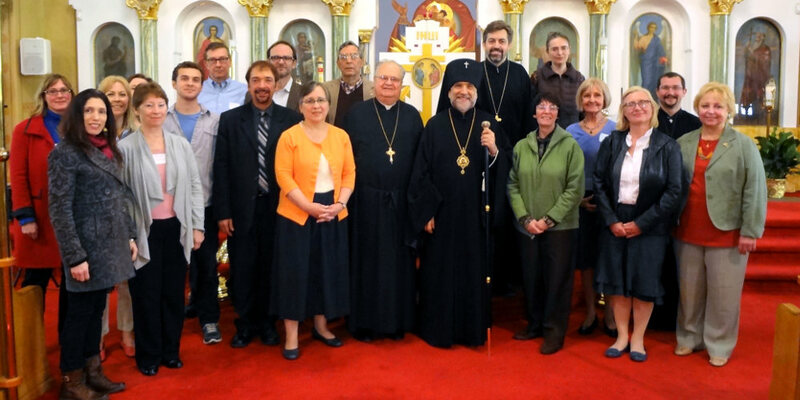 On 2 May 2015, Archbishop Michael and the Commission on Liturgical Music [CoLM] spent the day with more than 25 participants for a two-part workshop at Holy Trinity Church in Yonkers NY. In the morning, Mark Bailey (leading scholar in liturgical music; Director of the Yale Russian Chorus) led participants in an interactive session of learning and singing; the vitality of singing through rhythm, pulse, diction, and phrasing while expressing music liturgically. 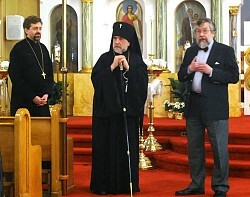 The afternoon’s presenter was liturgical expert Aleksei Shipovalnikov who, with His Eminence and Father David Cowan, “walked through” the more challenging parts of the Hierarchical Liturgy commenting on “what’s going on” from their perspectives. During lunch there was a “Stump the Panel” discussion where the presenters addressed questions from participants as well as questions that were sent in by those not able to be present. The CoLM encourages you to look at their webpage (on the diocesan website) where you will find numerous resources, including the extensive Hierarchical Liturgy Guidelines which were used at this workshop. SAINT ANDREW’S CAMP: Campers & Staff Make Ready for the 2015 Season!